Two Thursdays ago, I selected the Death & Co. Cocktail Book for the evening's refreshment. 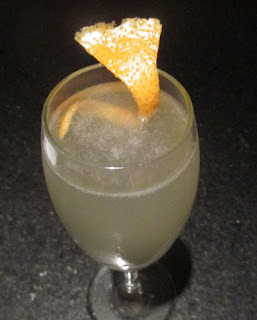 There, I was drawn to Joaquin Simo's 2008 sparkler, the Mucho Picchu that appeared like a cross between a French 75 and a Hemingway Daiquiri with pisco as the base spirit. Once prepared, the Mucho Picchu greeted the nose with a grapefruit and nutty cherry aroma. Next, grapefruit and wine on the carbonated sip led into earthy pisco on the swallow finishing with Maraschino's nutty fruit note.